Economic Education on a Global Scale! With Dr. Einstein, Dr. Elvis Ahmedi, Founding Head of the National Board for Cancer Control of Kosovo, original IVLP Gold Star (2011), and World Partnerships alumnus! And each IVLP group visits the Albert Einstein Memorial, adjacent to the National Academy of Sciences and across the street from the US Department of State, one of Washington's great public art sculptures. So, before the "New Generation" heads out on their three week professional programs around the United States, they spend a few days in Washington learning about the Federal system of government. They also have an opportunity to experience the vibrant US history and cultural traditions celebrated in our nation's capital. IVLP visitors are hosted by Washington-based institutions and organizations who have national responsibility to carry out the US Department of State "International Visitor Leadership Program". 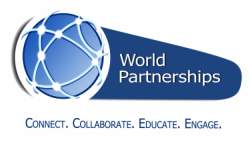 World Partnerships is proud to partner with all of them!